REAL SAGA (AUS) (2006). 4 wins at 2, STC Todman S., Gr.2. Sire of 329 rnrs, 190 wnrs, inc. SW Candelara (ATC Adrian Knox S., Gr.3), Real Surreal, Sylpheed, Real Good, Sagaronne, Secret Saga, SP Sagatona, Stroak, Epic Saga, Kirabo, Easy Drama, Choose a Saga and of Real Princess, Realing, Powerful Saga, Saga Miss, Saga of the Storm, A Day to Remember, No Problem, Outback Saga, Hot Saga, Real Mean, You Did What, Astir, Bimini Road, Epic Piper, etc. Tiger Master (g. by Bradbury's Luck). 6 wins from 1600m to 1800m, S$280,773, Singapore TC Class 3 H., Panasonic Communications Systems S., Kranji Stakes C, Initiation P., Class 4 H., Benchmark 67 H., 3d Singapore TC Benchmark 83 H., Benchmark 83 H., Initiation P., Benchmark 67 H.
Caledonia's Call (g. by Show a Heart). 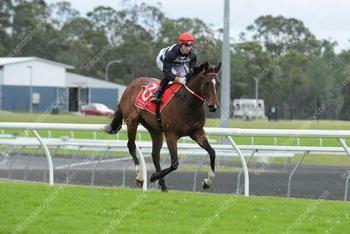 3 wins from 1300m to 1850m, 3d BRC Goa Get Noticed P., Bundaberg Rum Small Batch P.
Atalaga (f. by Real Saga). Winner. See below. Gifted Leader. 5 wins from 1¾m to 17f, Sandown Bet Totepool H., 2d Newmarket Racecourses.co.uk H., York Queen Mother's Cup, Exeter Valentine Novice Hurdle. ZAFONIC (Gone West). Horse of the Year in Europe in 1993. Head of The 1992 2YO & 1993 3YO European Classifications. 5 wins-4 at 2-from 1200m to 1600m, £205,922, 1,628,000fr., The Two Thousand Guineas, Gr.1, Deauville Prix Morny, Gr.1, Newmarket Dewhurst S., Gr.1, Longchamp Prix de la Salamandre, Gr.1, Deauville Prix de Tancarville, 2d Maisons-Laffitte Prix Djebel, L. Sire. ZAMINDAR (Gone West). 2 wins at 2, Deauville Prix de Cabourg, Gr.3, Maisons-Laffitte Prix de la Saone, 2d Deauville Prix Morny, Gr.1, Prix de Ris-Orangis, Gr.3, 3d Longchamp Prix de la Salamandre, Gr.1. Champion sire. ANNOUNCE (Selkirk). 5 wins from 2000m to 2500m, €394,960, Deauville Prix Jean Romanet, Gr.1, Chantilly Prix Allez France, Gr.3, Deauville Prix Minerve, Gr.3, Longchamp Prix de Thiberville, L, Prix des Favorites, 2d Longchamp Prix de l'Opera, Gr.1, Saint-Cloud Prix Corrida, Gr.2, Longchamp La Coupe, Gr.3, 4th Grand Prix de Vichy, Gr.3. Producer. MEXICAN GOLD (Medaglia d'Oro). 3 wins-1 at 2-from 1500m to 1700m, €128,035, US$92,000, Longchamp Prix de la Grotte, Gr.3, Deauville Prix d'Hotot en Auge, 2d Maisons-Laffitte Prix de Saint-Cyr, L, 3d Longchamp Poule d'Essai des Pouliches, Gr.1, Belmont Athenia S., Gr.3, 4th Del Mar Matriarch S., Gr.1. Shuttle Diplomacy (Seeking the Gold). 2 wins at 1400m, Longchamp Prix de Tivoli, Prix des Arts et Metiers, 2d Longchamp Prix de Fontainebleau, Gr.3. Sire. Press Baron (Private Account). 2 wins at 2, 3d Evry Prix Herod, L, Prix Matchem, L, Longchamp Prix de Suresnes, L.
Desert Image (Beat Hollow). Winner at 2, 2d Newmarket Montrose S., L, Newbury Dubai Duty Free Full of Surprises 2YO Fillies' S. Producer. Botanic (Mr. Prospector). Winner at 6½f in U.S.A, 2d Maisons-Laffitte Prix Cor de Chasse, L. Sire. Moorside (Champs Elysees). Winner at 1½m, 2d Chester Cheshire Oaks, L, 4th Leopardstown Stanerra S., L.
Well Dressed (Sadler's Wells). Winner at 2200m, 2d Longchamp Prix de Courcelles, L, Chantilly Prix du Labyrinthe, Saint-Cloud Prix d'Ellon, 4th Le Croise-Laroche Grand Prix du Nord, L.
MAITRES D'ART (Zenno Rob Roy). 6 wins-2 at 2-from 1600m to 2000m, 157,906,000¥, to 2017, Chukyo Chunichi Shimbun Hai, Gr.3, Tokyo Amethyst S., Tamagawa S., 3d Niigata Daishoten, Gr.3, Nakayama Keisei Hai, Gr.3, Tokyo Kyodo News Service Hai, Gr.3. ROSTOVA (Arch). 4 wins-1 at 2-from 1400m to 1800m, Chantilly Prix Casimir Delamarre, L, Goodwood Breeders Backing Racing Fillies' S., Newmarket NGK Spark Plugs H., 4th Toulouse Prix Fille de l'Air, Gr.3. PAVLOSK (Arch). 2 wins at 7f, 1m, York Fillies' S., L, Newbury Bridget Fillies' S., 4th Lingfield Chartwell S., Gr.3, York Strensall S., Gr.3. IRISH ROOKIE (Azamour). 2 wins at 2, £92,349, €137,670, Newmarket Montrose S., L, 2d Longchamp Poule d'Essai des Pouliches, Gr.1, Curragh Ridgewood Pearl S., Gr.2, 3d Newmarket Sun Chariot S., Gr.1. DARING LOVE (Big Shuffle). 3 wins at 2 in Germany, Baden-Baden Maurice Lacroix Trophy, Gr.2, Cologne Oppenheim Rennen, L.
DARING MATCH (Call Me Big). 5 wins to 1300m, €150,450, to 2017 in Germany, Hoppegarten Hoppegartener Sprint Cup, L-twice, 2d Baden-Baden Goldene Peitsche, Gr.2, Silberne Peitsche, Gr.3, 3d Baden-Baden Goldene Peitsche, Gr.2. COUGAR MOUNTAIN (Fastnet Rock). Joint Champion Older Male Miler in Ireland in 2015. 3 wins at 6f, 1m, £183,956, €95,620, US$20,000, QAR160,160, Newmarket Joel S., Gr.2, Leopardstown Desmond S., Gr.3, 2d Curragh Phoenix Sprint S., Gr.3, Leopardstown Desmond S., Gr.3, Amethyst S., Gr.3, Qatar Irish Thoroughbred Marketing Cup, 3d Royal Ascot Queen Anne S., Gr.1, Leopardstown Amethyst S., Gr.3, 4th Sandown Eclipse S., Gr.1, Naas Renaissance S., Gr.3, Leopardstown Heritage S., L.
Ambiguity (Fastnet Rock). Winner at 2, 3d Curragh Marble Hill S., L.
Served by Ready for Victory. Date of last service, 09.11.2017.